Better wave and wind forecasts that can help save lives are possible this summer after two more weather buoys were recently released earlier into the Great Lakes. The buoys cost more than $50,000 each and are funded through the National Oceanic Atmospheric Administration Coastal Storm program. 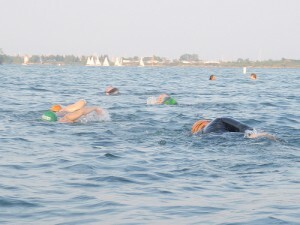 One was placed in Lake Erie near Erie, Penn. and the other was put in Lake Michigan near South Haven, Mich. There are now 19 similar buoys across the Great Lakes deployed by a range of organizations and universities, said Ed Verhamme, project engineer at LimnoTech, an Ann Arbor, Mich. The private company assists with data management and manages the weather buoy off of Port Sheldon, north of Holland, Mich. Seven of them are in Lake Michigan. 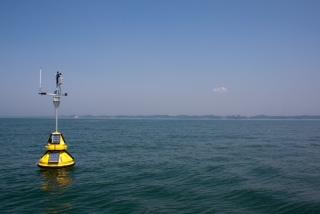 The buoys have been used since the 1980s to provide information like wave height, wind speed and direction, Taylor said. In the past, meteorologists were unaware of how high nearshore waves would get. Without the buoy observations they were unable to make an accurate forecast, Taylor said. “Lake Michigan can be a great place to swim but when waves are up, it can be dangerous,” Taylor said. “It’s hard to say if they’ve saved lives — but I think they have,” Taylor said. “When somebody doesn’t drown because the weather service gave a good observation and sends out a statement that it’s not OK to swim in the lake and somebody doesn’t drown, it’s hard to prove that,” he said. Megan Dodson, a beach hazards program manager with the National Weather Service in Marquette, Mich., agreed that weather buoys save lives. She also acknowledged the lack of evidence to prove swimmer fatalities have gone down. The Great Lakes Surf Rescue Project reports that there have been 347 drowning’s in the Great Lakes since 2010. The year with the most drownings since then was 2012 when 101 were reported. The fewest were the 68 reported in 2013. Lake Michigan had 167 drownings since 2010, the most of any Great Lake. In 2013, it claimed 24 of the 68 Great Lakes drownings. So far this year, 17 Great Lakes drowning have been reported. But the number of drownings can be misleading. “It’s hard for us to evaluate the effectiveness of our education and outreach efforts or forecasts based on the number of incidents,” said Dodson. “This is because there are so many factors that go into why an incident occurs. The buoys have eliminated a lot of guesswork, she said. NOAA has weather stations along the beach but doesn’t have much of a way to get information from out in the water, said Verhamme. Forecasters relied on boaters and fisherman to contact the stations with weather reports. Beachgoers often drove to a lake to check conditions. Now forecasters can take nearshore wave conditions into account to warn people, he said. The buoys unexpectedly found that nearshore water conditions were often more rough than those farther out in a lake. The nearshore waves tend to build up because of the temperature of the water, Taylor said. The warmer water causes bigger waves. Editors’ note: The Great Lakes governors have designated this week as Great Lakes Beach Safety Awareness week. This story was updated June 12, 2014 to correct the location of the new Lake Michigan buoy.